Kevin McAleenan wasn’t a political aide in his rise through government, where he served in senior border security positions under both the George W. Bush and Barack Obama administrations. Nevertheless, President Donald Trump’s promotion of the commissioner of Customs and Border Protection to serve as acting secretary of the Department of Homeland Security likely will prompt a partisan divide. After Homeland Security Secretary Kirstjen Nielsen’s resignation Sunday, Trump quickly announced he was naming McAleenan as acting secretary. She reportedly resigned after a meeting with Trump, amid the president’s disappointment with continued problems at the southern border. 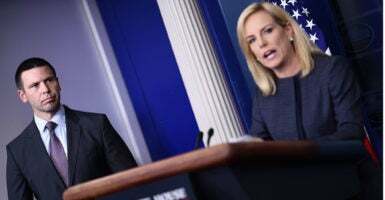 Nielsen, 46, had served as homeland security secretary since Dec. 6, 2017, succeeding her former boss, John Kelly, when he left the post to become White House chief of staff. Trump tapped McAleenan, 47, for the top post after his work enforcing some of the administration’s more controversial policies, such as “zero tolerance” for illegal immigrants crossing the border. The commissioner also has supported a border wall and testified before Congress that there is a crisis at the border. Obama named McAleenan as acting deputy commissioner of Customs and Border Protection in 2013, and he was sworn in as the permanent deputy role at DHS under Obama in 2015. The Senate overwhelmingly confirmed him as commissioner in March 2018 by a vote of 77-19. However, McAleenan’s apolitical past is no guarantee of a smooth confirmation process should Trump nominate him for homeland security secretary in the long term, said Art Arthur, a former federal immigration judge and general counsel for the Immigration and Naturalization Service, now known as Immigration and Customs Enforcement. “He has been at the tip of the spear, so it makes sense President Trump would tap him for the position as at least a placeholder, since he has been taking heat,” Arthur, now a resident fellow for law and policy at the Center for Immigration Studies, told The Daily Signal. “CBP has been doing its job, which is apprehension and detention,” Arthur said, referring to Customs and Border Protection. “He has extensive experience with the Obama administration, but I don’t know how significant that would be” in a nomination fight. Arthur referred to the need for Congress to pass legislation closing loopholes created by the so-called Flores settlement, which largely requires the government either to separate children from families at the border or to “catch and release” them. Arthur said other potential candidates for the top DHS post are former Kansas Secretary of State Kris Kobach; Lee Cissna, director of U.S. Citizenship and Immigration Services; and Thomas Homan, former acting director of Immigration and Customs Enforcement. There is reason to object to McAleenan’s being nominated for the role in the long term, said Rosemary Jenks, director of government relations for NumbersUSA, an organization that seeks enforcement of immigration laws and limits on legal immigration. Jenks said McAleenan was not forthcoming about catch-and-release policy and that McAleenan and Nielsen did not tackle visa fraud. Jenks said Kobach would be the best fit for the job. McAleenan, born in Honolulu, Hawaii, is a graduate of Amherst College and received a law degree from the University of Chicago Law School. He practiced business and corporate law in California. It was after the terrorist attacks on Sept. 11, 2001, that reportedly inspired him to join Customs and Border Protection, initially still working in California. From 2006 to 2008, McAleenan served as the agency’s area port director of Los Angeles International Airport, directing border security operations at this and 17 other airport facilities in one of CBP’s largest field commands. 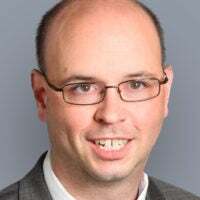 During the Obama administration, he moved to the position of deputy assistant commissioner for the agency’s Office of Field Operations. He became acting assistant commissioner in late 2011. On March 30, 2013, Obama named McAleenan as CBP’s acting deputy commissioner. When Trump took office, McAleenan immediately became acting commissioner by default. The president nominated him for the post in January 2018, and the Senate confirmed him in a bipartisan vote the following March 19. He was sworn in the next day. “I have no idea if he’ll be the nominee, but he is a professional, knows a lot about the border, and he has the confidence of the president,” James Jay Carafano, vice president for national security and foreign policy at The Heritage Foundation, told The Daily Signal.